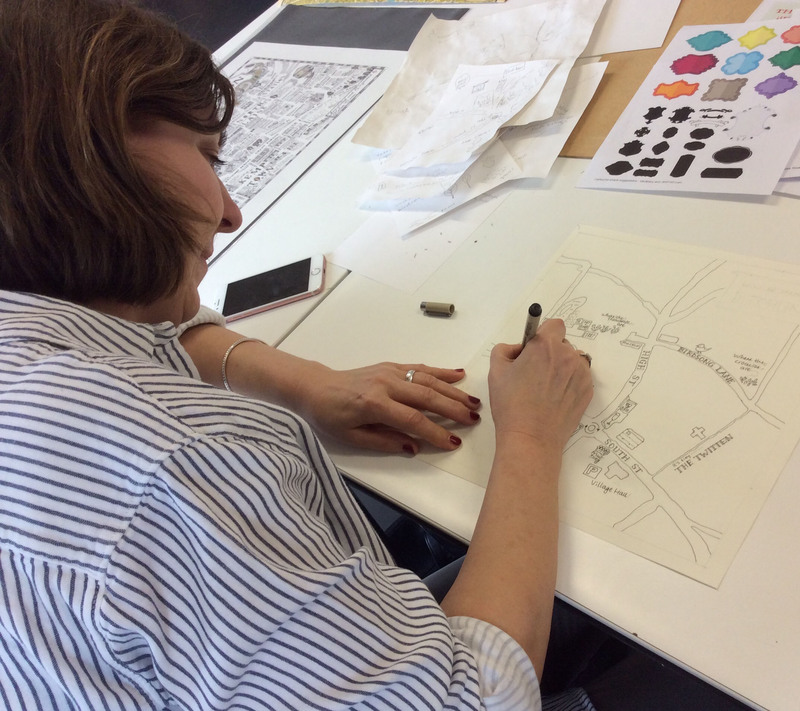 This is just a short post acting as an update to the last one about my hand drawn mapping workshop held at the award winning Ditchling Museum of Art + Craft in Sussex on Saturday 10th March 2018. I had a really interesting day with my 6 students, who came from all walks of life and from around the country – even as far away as Devon. 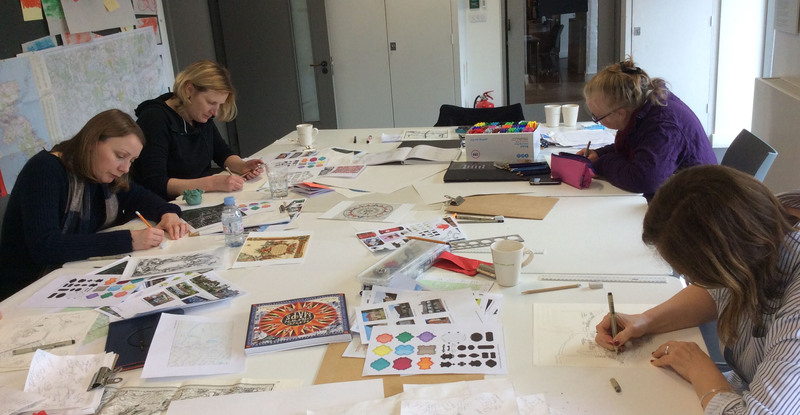 We began the workshop with a damp walk around Ditchling village, note-taking, sketching and taking photographs. It’s certainly a very pretty place with half timbered houses, old barns, a village green and pond next to a beautiful church, dating back to Saxon times. 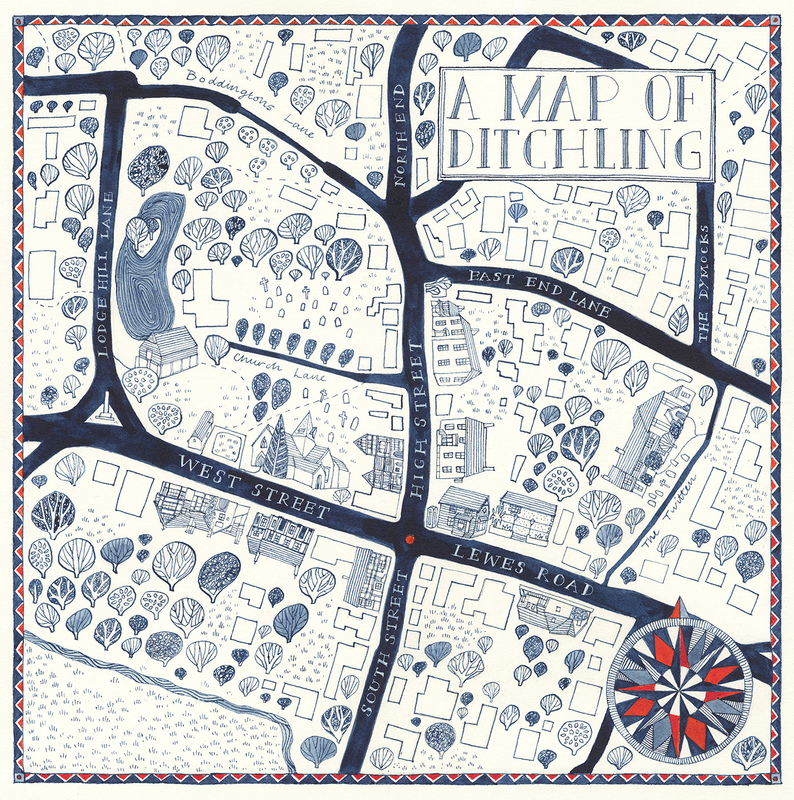 There are plenty of anecdotes and interesting stories about Ditchling too, of smugglers and witches, Pagans and Quakers. There’s a ghost who hates shut doors haunting the latticed windowed Wings Place and a Sarcen stone – possibly once a standing stone – buried in the flint walls of the church. Famous and infamous people have lived here for centuries. From a mysterious “smuggler-landlord” who made his home in Conds Cottage, to Eric Gill, the Arts and Craft printmaker who lived in the red brick “Sopers”, both on the high street. Places are coloured by personal, perhaps more mundane stories too. One of the residents proudly showed us the black, highly decorative Victorian sewage pipe she had in her garden and another pointed out Lodge Hill which makes for fantastic sledging in Winter snow. Some of the students at the mapping workshop at the Museum Studio. Walking the territory is important to truly get a feel of the place. Back at the studio, it was clear from the multiple online maps we used as reference that what we saw on foot didn’t necessarily correlate. Footpaths were straight, not curved. Small roads tied one place to another and didn’t stop mid track. Noticing what to map was also taken from personal experience. 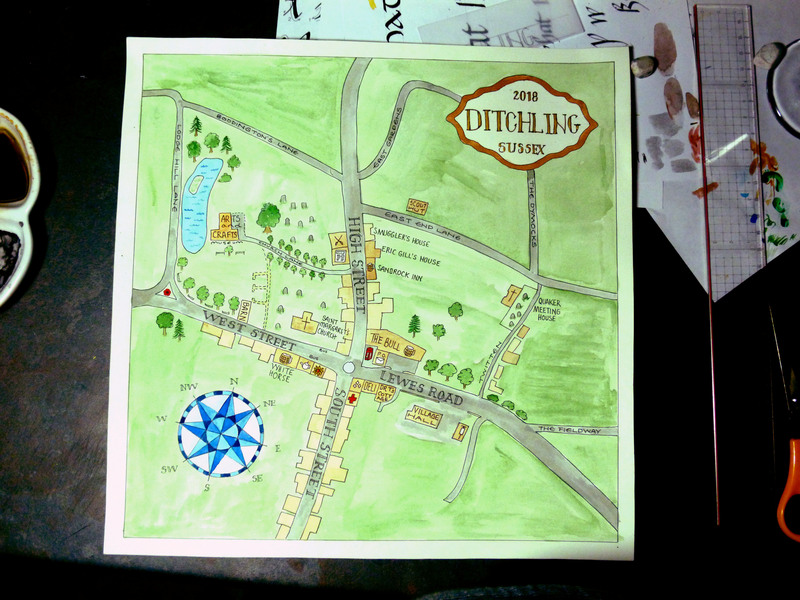 One student chose to document places showing the signs of spring in Ditchling and eventually her map was covered in snowdrops and bobbing daffodils. Features you would never have found on another mapmaker’s work but no less important to her than the bus-stops and telephone boxes that others drew. Kate Lee working on her map. And it was because of this personal understanding of the place that each map was different. We built up the traditional hand drawn map skills; the gridding up, the constructing of compass roses and cartouches and the adding of hand lettering. All of these inherently show the personality of the mapmaker through her hand and aesthetic choice. But each mapmaker also made decisions about what features of Ditchling to include and leave out. They could focus on the beautiful buildings if they liked, or ignore them and map the oak trees they saw instead. By the end of the day, there were 6 hand drawn maps, all of the same place, but each distinct and original to the mapmakers themselves. Each map was truly of one place, by one person at one particular time. 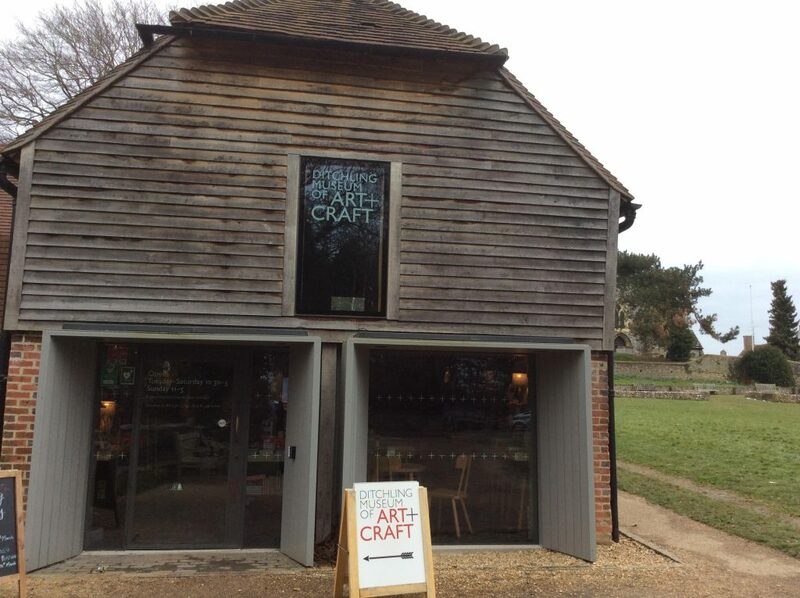 I really enjoyed teaching the workshop and thanks must go, not only to all the students and their fantastic powers of concentration, but also to Ditchling Museum of Art + Craft for the invitation to teach in such a beautiful location. Yes Sue, of course. I’ve sent you an email.